This year we discovered the best ever children's summer shoe thanks to the Nordstrom Children's Department. Everywhere we go, people stop me to ask where we got Coco and Theo's shoes and I can't help but gush that they're amazing, so easy for little kids to put on without help, and that they stay remarkably clean through all of their climbing, scootering and exploring. They're Native Shoes - find Theo's here and Coco's here - and I could not possibly love them more. Initially I balked at the $35 price tag ($29.90 for Coco's through this Sunday on the Anniversary Sale!) because it seemed like a lot for what is essentially a plastic shoe. But once Coco and Theo tried them on, I saw that they're actually quite well made and provide arch support with a stable sole. We took a chance on them and they have proven to be comfortable for everything from biking to running. Have you tried Native Shoes for your children? 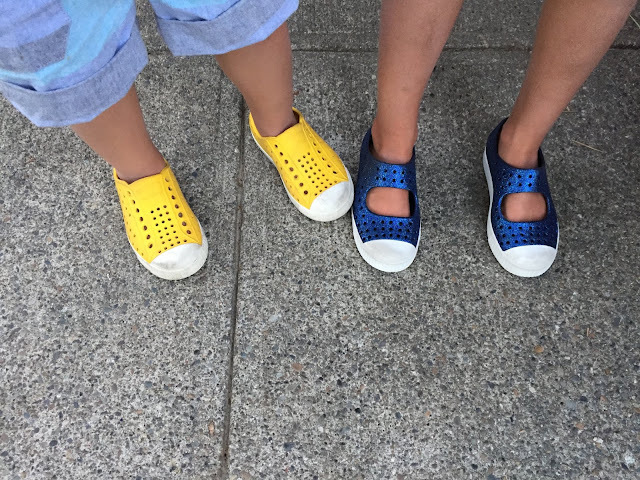 What are your go-to summer kids' shoes? I’ve gotten Natives for my two kids for the last several years and we absolutely love them! No negatives here. They’re perfect for splashing in water and when we are at the beach. I used to wash them with soap and water until I realized that a Magic Eraser keeps them in perfect condition! The white always stays white! It’s also worth mentioning that while the glow in the dark sole of some styles is super fun, the white part yellows and tends to always look dirty. I won’t buy that style again but will stick with the pure white.